Are you looking for a way to bring floorstanding iPad stands to your sales environment to protect your tablets from theft? These iPad stands all feature a locking mechanism to keep installed electronics secure. Locking up the equipment will give any business owner a certain peace of mind, knowing that their devices are well protected from theft. The iPad stands, also known as Apple tablet mounts, free up your staff to work with the customers. They'll be able to provide better service to your guests as one eye won't invariably have to be watching the displays. 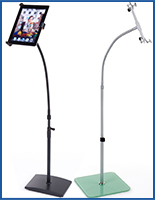 iPad stands with locking devices bring many other benefits to a business as well. The exposure and attraction gained by incorporating an iPad into a promotional display is formidable. The ways that iPad stands can be used within a business are numerous as well. And the free-standing bases mean that you can set them up in areas where you know they're going to get the most attention. 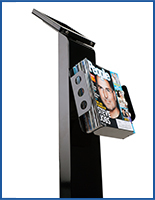 These secure iPad stands for high traffic locations are a great investment for any business! What are some features of the portable tablet kiosks? As mentioned previously, an ipad stand that locks an iPad for public viewing, like all of the displays available in this category, comes with locking mechanisms to provide an incredibly secure display that's able to be used in high traffic areas. Some models use security screws to keep your iPads firmly within the case, while others have more customary lock and key systems. Both designs provide equally effective security. There are also methods available for locking down the kiosk itself. Some stands feature pre-drilled holes that allow the kiosks to be bolted directly the floor, making them almost impossible to move. Other models are capable of incorporating a Kensington lock system that will secure the holder to an immovable device, such as a heavy table, counter, or cabinet. On many of the kiosks, the actual iPad mounts have a number of adjustable features. All of them give you the option of showing the screen in either a portrait or landscape orientation. 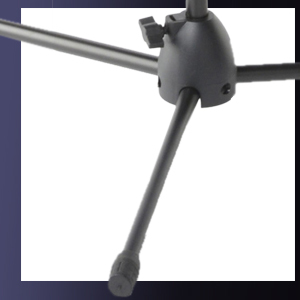 Some models also incorporate tilting mounts, allowing you to find the best viewing angle possible for your customers. Convenience is key with these tablet displays. While the designs are numerous, all of them are manufactured with the goal that each and every model would be easy to use in just about any location. In general, the case and kiosk stands are lightweight. This makes them easy to relocate and setup in the areas where you know the most foot traffic will be. For times where moving the kiosks as is isn't a possibility, all of the designs can be disassembled in less than five (5) minutes and reassembled just as quickly. This is especially good if you're planning on taking your case on the road with you. The sooner you can get the holders installed the sooner passersby and potential customers will take notice of your promotional displays. 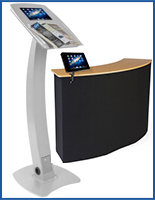 The touchscreen stand mounts available in this category have differing designs as well, though all are notably secure. Some designs provide easy access to things like charging ports, home and power buttons, and volume controls. Other designs keep the iPad more locked down, restricting access to the home button and keeping unauthorized users away from certain areas within the system. With these models a stylus is usually included for reaching the volume controls and the main power button, but aside from that all programming changes need to be made when the iPad is outside of the case. To compensate for the lack of access, however, a few other perks have been worked into the holders. Certain models have a wider central support that contains a lockable cabinet with a engineered in power strip. This will let you keep your tablet fully charged throughout the day, making sure customers can invariably access the materials stored on the tablet.